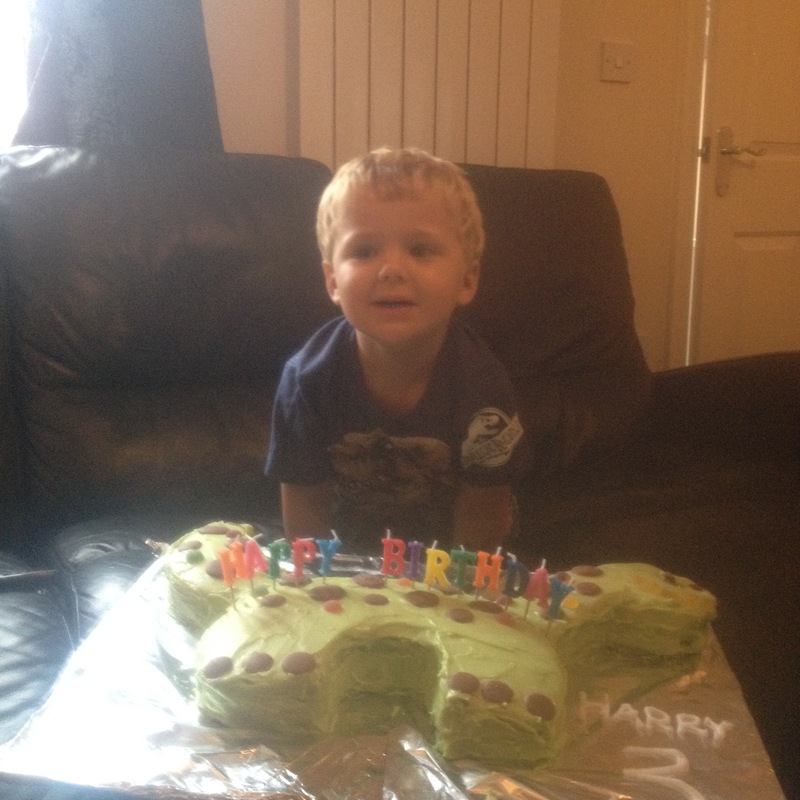 I’m presently sat on the trampoline in the back garden enjoying the evening sunshine with the kids, flicking through old photos on my phone and have just found a picture of Harry’s 3rd Birthday cake. There is a bit of a back story to this cake. 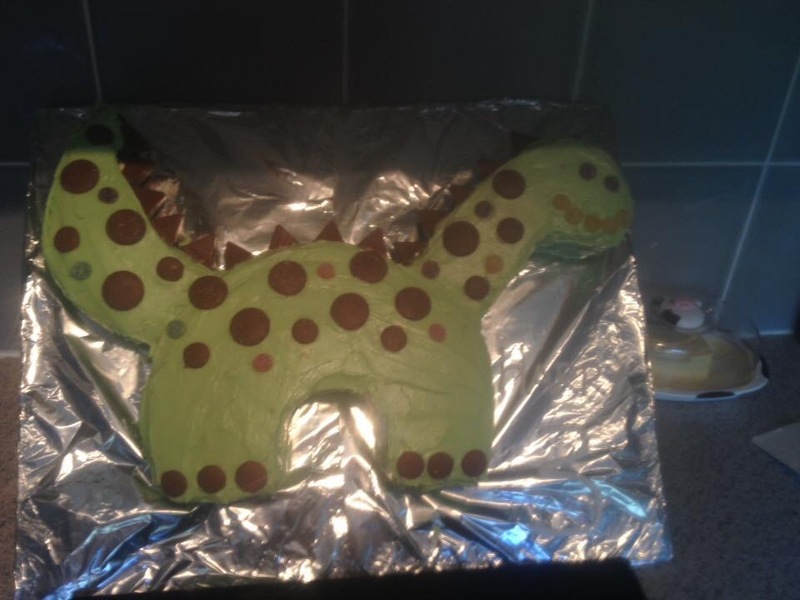 I was 10 months pregnant with Charley when Harry really wanted a T-Rex cake for his Birthday. 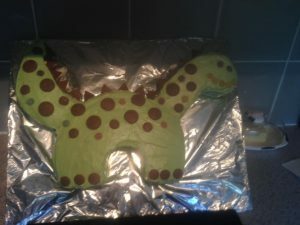 None of the supermarkets did T-Rex cakes and the cheapest quote I could got from a cake maker was £45, so I decided to make one myself. Now anyone who knows me knows I can burn water but after a conversation with my husband & MIL who both said I would never be able to do it, sheer grit & determination took over me. 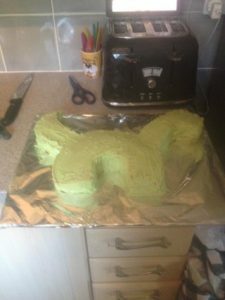 You will have to excuse the poor quality of the photos as they were only taken to prove I did it all myself but thus to say I had a very happy 3yr old on his Birthday & earned a few gold stars off the other mums for making it . Plus, the smug satisfaction of proving my hubby & MIL wrong. So if you fancy having a go and trust me if I can do it so can you, here’s how to get cracking. 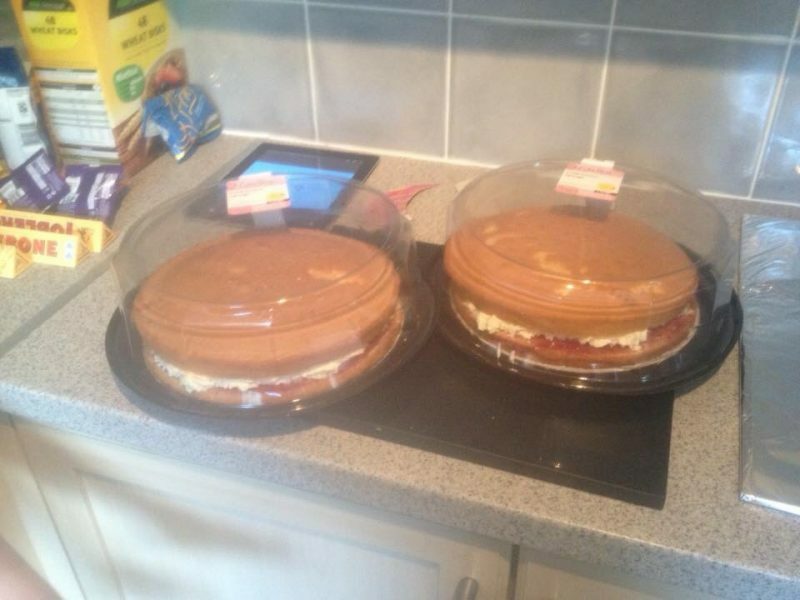 Place the body template on one cake & the neck and tail on the other cake as per diagram attached to the template. Take a sharp knife and cut around the templates until you have the neck, body & tail. 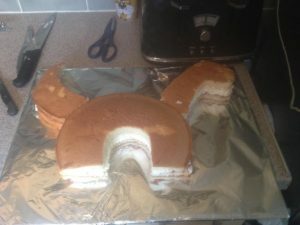 Place the neck, body & tail on the cake board and attach the pieces together using a small amount of frosting. Mix the remaining frosting together with 4-5 drops of green gel colouring. Use more or less green colouring as you desire. Pop the cake in the fridge for 30 minutes. Once the frosting is done its time to decorate. Break the Toblarone up and place pieces all the way down the dinosaur from its head to its tail. Decorate the rest of the dinosaur with chocolate buttons. I used large ones & small ones. Pop back in the fridge until needed. It took me about 1.30hrs to complete the cake and I’m sure the bakers among you could make your own sponges but for the hopeless in the kitchen like me I took the easy option. I hope you have enjoyed today’s post. Please feel free to leave me a comment or post any birthday cakes you have made on my Facebook page. "Living Arrows 35/52 – A Celebration of Childhood"
Very impressive. Might have to have a go at this one!